On our website you will find a clamp on tester that is ideal for measuring AC or DC voltage. The clamp on tester is irreplaceable for inspection work and maintenance. We offer the following: voltage detector, voltage leak detector, voltage power detector, metric detector, and current detector and more. The high quality clamp on tester includes the ability to measure many other parameters, such as capacity, resistance, power (both by way of clamps or a hand held digital device with external clamps with a range of one or three stages). The high variety of quality products within our product range is the reason why many professionals like tool makers, electricians and other craftsmen trust in our instruments. The clamp on tester serves as a form of personal protection for builders on the building site The clamp on tester, like the majority of our measurement instruments, meets and excels ISO standards. Every clamp on tester can perform the demanding tasks in each industrial sector regardless of the technical problem encountered. Clamp on Tester with network Analyzer / Clamp on Tester with data logger. The Clamp on Tester (Graphic Power Quality Analyzer) PCE-GPA 62 is used for single-phase or three-phase measurements of the active, reactive and apparent power, power factor, phase angle, energy, voltage, current as well as peaks and harmonics up to 50? of the harmonic waveform. As all test instruments, the Clamp on Tester is delivered manufacturer calibrated (ISO certification is available optional). This clamp on tester is used for single-phase or three-phase measurements of the active, reactive and apparent power, power factor, phase angle, energy, voltage, current as well as peaks and harmonics up to 50º of the harmonic waveform. The clamp on tester is equipped with data logger. The test instrument is delivered manufacturer calibrated (ISO or certification as an option). The PCE-CM 3 clamp on tester is used for quick and easy AC measurements. For current measurement, the PCE-CM 3 clamp on tester is plugged over the live conductor. The clamp on tester PCE-CM 3 is particularly suitable for the measurement of alternating current in distributions and wherever circuits must not be interrupted. Clamp on Tester for measuring AC current, AC voltage, DC current and frequency. The reduced dimensions of this device allow for measurements to be taken in places with limited access. The backlight display ensures that it is easy to read, even in places with limited light available, such as electrical cabinets or in cabling ducts. The Clamp on Tester (as all the test instruments) comes manufacturer calibrated - ISO certification is available as an option. 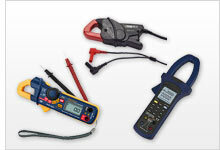 Clamp on Tester to determine indirectly, the AC/DC currents with high accuracy. PCE-PCM 1 is a multipurpose clamp-on tester or power analyzer used to measure alternating current (AC), voltage (TRMS) and frequency to determine active (kW), apparent (kVA) and reactive (kVAR) power as well as active energy (kWh) consumption. Both the phase angle and the power factor (cos φ) are shown on the handheld power meter's large and easy-to-read backlit display. Clamp on Tester PCE-LCT 1 to test leakage / RMS measurement / continuity and resistance test. The Clamp on Tester can measure leakage currents which appear when current flows through electrical conductors which are not designed for conduction current. The Clamp on Tester, as all test instruments, is delivered manufacturer calibrated, but can additionally be certified to ISO. The clamp on tester PCE-DC 41 can measure voltages up to 600 V, currents up to 600 A and electrical resistance up to 1000 Ω. To perform a measurement, you can either use the measuring leads, which are included in the package of the clamp on tester, or you can use the integrated clamp mechanism. By using the clamp of the clamp on tester, you are able to measure the electrical parameters of an electrical conductor contact-free and without disconnecting it. This clamp on tester was developed for the indirect acquisition of AC / DC currents as well as the frequency. A non-contact voltage tester function and a flashlight for illuminating the measuring point were also integrated in this clamp on tester. Clamp on tester for measuring AC/DC current, AC voltage and resistance. This clamp on tester is designed to indirectly detect AC/DC current and ohms. The clamp on tester has white LEDs which illuminate the point of measurement and test the voltage without contact. Small dimensions of this device allow to take measurements in places with limited access. The clamp on tester comes manufacturer calibrated and can optionally be certified according to ISO or standards. With the PCE-LCT 1-ICA clamp on tester, it is possible to measure leakage currents in the range of up to 100A. Leakage occurs when a current flows through an electrical conductor that is not normally designed to conduct electricity. The PCE-LCT 1-ICA clamp on tester captures these currents and displays them on the display. With the PCE-PA 8000 Clamp on Tester you will be able to perform prolonged measurements of electrical properties. The measurement data is saved in xls format on the included SD card to be easily transferred to a computer or laptop for review. The Clamp on Tester comes manufacturer calibrated and can be certified to ISO or UTIL standards as an option. The PCE-360 is a Clamp-On Tester with data logger functionality. This versatile power analyzer can take single-phase and three-phase power measurements both in real time and over an extended time period. The PCE-830 Clamp on Tester is used for measuring one to three phases of electrical quantities for alternating current (AC). This Clamp on Tester also measures parameters such as voltage, current, frequency, harmonics, and power as well as indicating, according to standard EN50160, harmonic values, interharmonics, and asymmetrics. Interference, such as interruptions, leaks, overloads, or transience (from 16 µs) are detected with their corresponding values. The power logging instrument is delivered manufacturer calibrated. An ISO calibration certificate may be ordered optionally. The PCE-830-2 Clamp on Tester is used for measuring one to three phases of electrical quantities for alternating current (AC). This Clamp on Tester also measures parameters such as voltage, current, frequency, harmonics, and power as well as indicating, according to standard EN50160, harmonic values, interharmonics, and asymmetrics. Interference, such as interruptions, leaks, overloads, or transience (from 16 µs) are detected with their corresponding values. The power logging instrument is delivered manufacturer calibrated. An ISO calibration certificate may be ordered optionally. The PCE-830-3 Clamp on Tester is used for measuring one to three phases of electrical quantities for alternating current (AC). This Clamp on Tester also measures parameters such as voltage, current, frequency, harmonics, and power as well as indicating, according to standard EN50160, harmonic values, interharmonics, and asymmetrics. Interference, such as interruptions, leaks, overloads, or transience (from 16 µs) are detected with their corresponding values. The power logging instrument is delivered manufacturer calibrated. An ISO calibration certificate may be ordered optionally.